Remember when I told you about some of the foods I hate but wish I liked? Well, my tastes have evolved quite a bit since I shared that post a year and a half ago… who knew that was possible?! First, I shared my new love of mint in mint infused water and mojitos. Then I fell for salmon, baked in parchment paper or broiled with orange cream. And now, bell peppers. I really never saw this day coming. 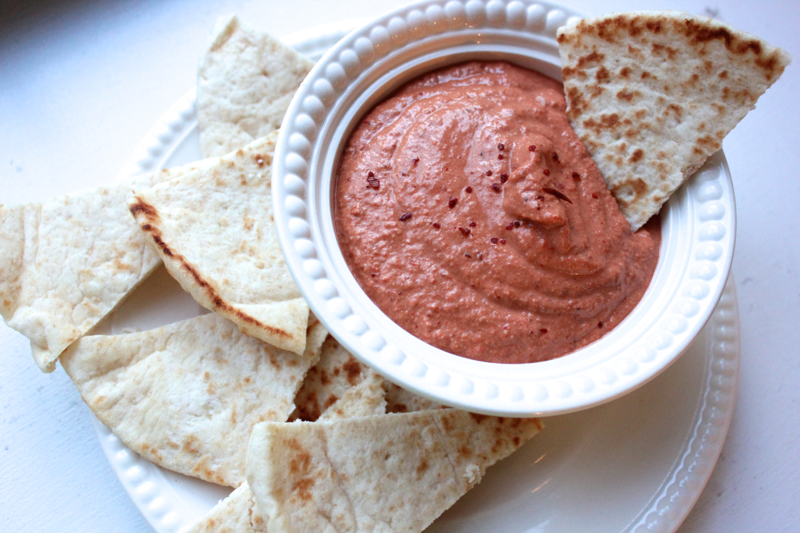 I sampled this roasted red pepper dip in my cooking class and was shocked by how much I liked it. I even wrote in my notes, “Doesn’t taste like peppers too much,” which is a nice way of saying, “Not disgusting!” David thinks this dip does taste peppery, so maybe I’m just coming around to the flavor. This dip is multi-dimensional with spicy and tangy undertones. It’s great party food. Or dinner food paired with crispy pita chips when you’re home alone and can do whatever you want. 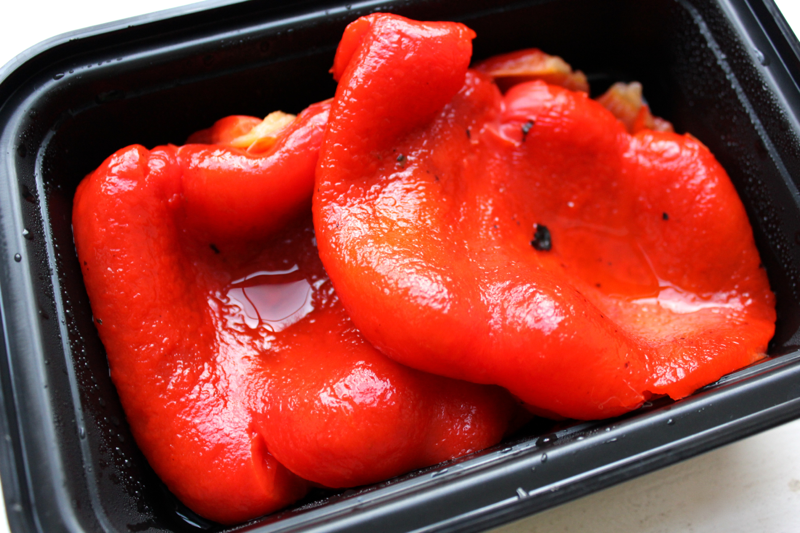 To make this dip, begin by roasting 2 red bell peppers. 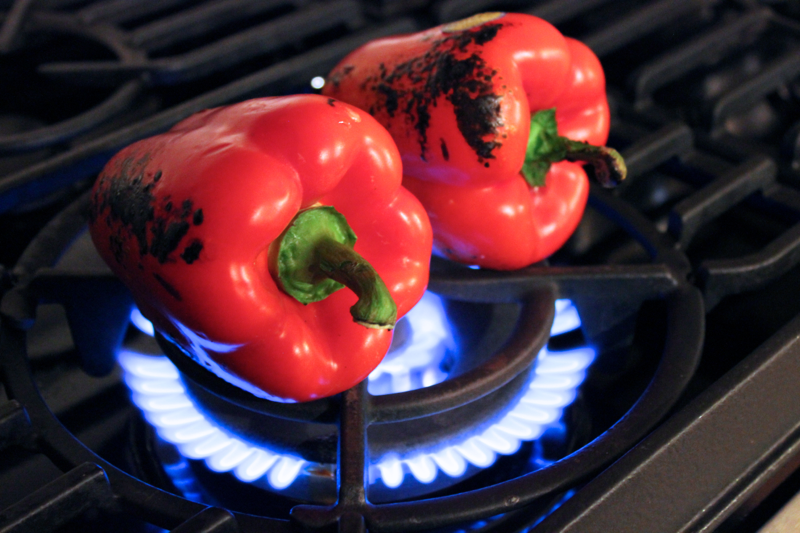 Just put them directly on a gas burner to char, rotating the peppers until they are totally blackened. My mom roasts lots of peppers at once under her oven’s broiler. 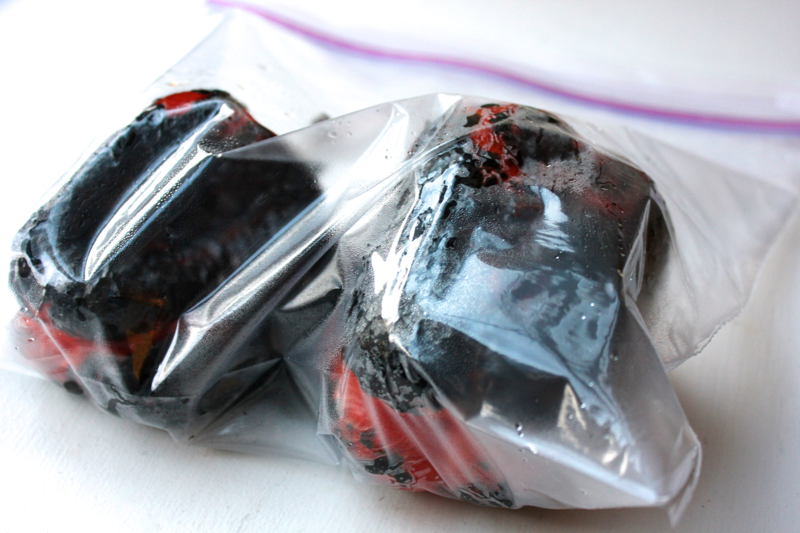 Once charred, put the peppers in a plastic bag and let them cool at room temperature. The peppers will steam themselves in the bag. Once cool, hold the peppers under running water, and brush off their skins. Split the peppers open and rinse out the seeds and membranes. 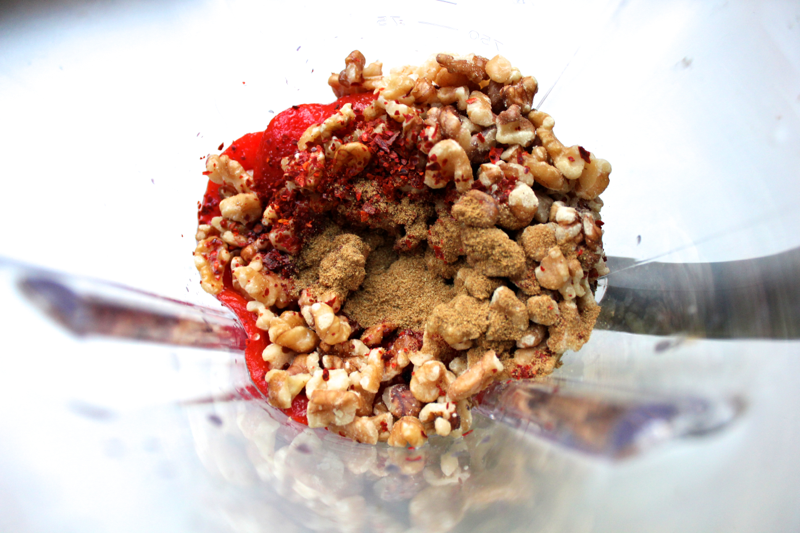 Put the roasted peppers into a blender. Add in about 1/2 cup of walnuts, 2 chopped garlic cloves, 1 teaspoon of pepper flakes, 1 teaspoon of cumin, 1 tablespoon of lemon juice, a pinch of salt, and 1.5 tablespoons of pomegranate syrup. You can find pomegranate syrup in some supermarkets, but mine didn’t carry it. Fortunately, it’s easy to make your own! Just buy a bottle of pomegranate juice, and pour it into a pot. Simmer the pomegranate juice until it reduces into a syrup. As the water cooks off, it will stop bubbling even though it remains on the heat. Once it reaches that stage, the syrup should easily coat the back of a spoon. Remove the syrup from the heat, let it cool, and then store it in a jar in the fridge. It’s sweet and tangy. 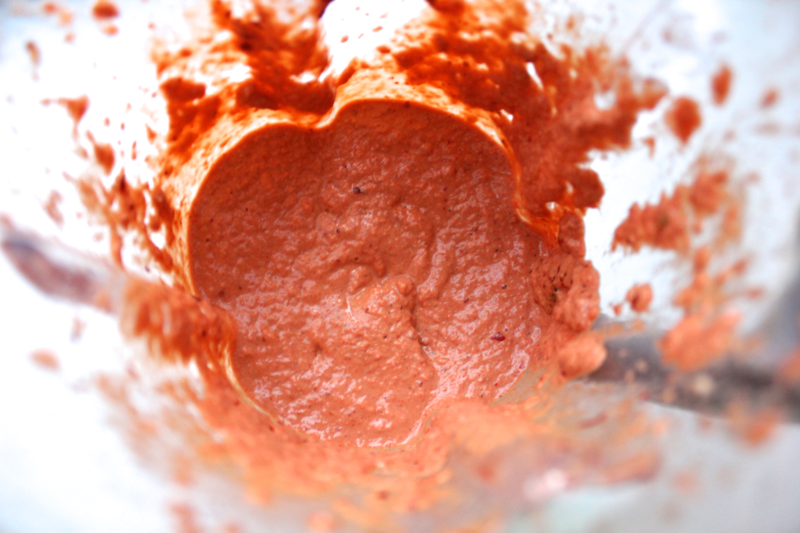 Blend the red pepper dip until it is smooth. Taste the dip, and add more of any of the ingredients you think it needs. I adjusted pretty much everything but the peppers and walnuts. Blend again. If you want the dip to have a thicker consistency, you can blend in some breadcrumbs. 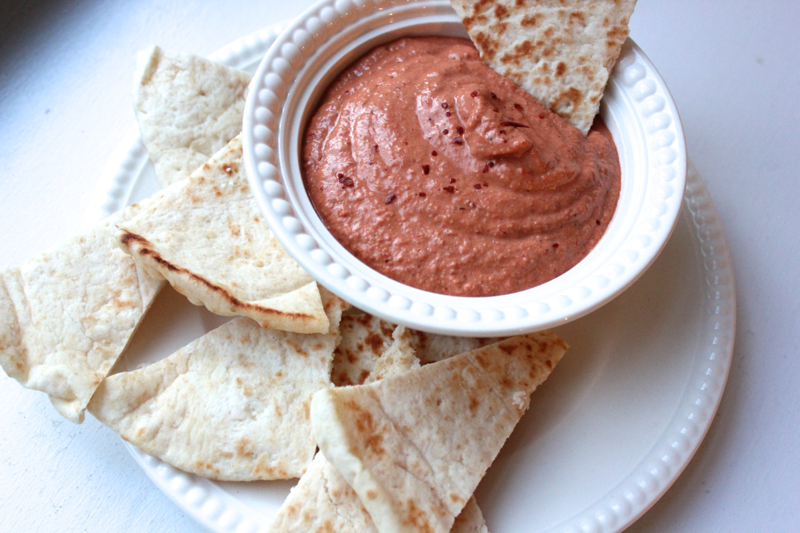 This dip is great served with crisped up pita. Just slice a pita into wedges, and bake it in the oven at 325 or 350º F until it browns and crisps. It’s also great spread on a sandwich. If you’re not a pepper lover like me, this dip just might help bring you around. Now if anyone could help me like goat cheese…(never going to happen). Would be good served with matza. Sounds like a healthy dish. You’re right on both counts! You can skip the plastic bag step and keep plastic bags out of the landfill! Some say to use a brown paper lunch bag, but you don’t even need that! Just set them on a plate or the cutting board and wait a few minutes. You know people have been roasting peppers for thousands of years before ziplock bags were invented! I’m not sure that a paper bag would do a good job containing the steam, but an overturned bowl or other sealed container would do the trick. Thanks for the thoughtful idea! Sounds delicious! 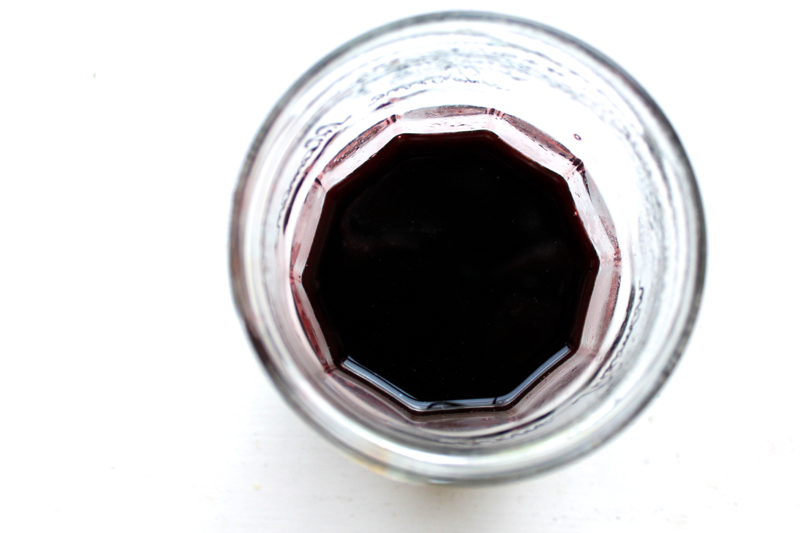 The pomegranate syrup sounds like it’d be great on pancakes/waffles too…or even ice cream.